Good morning all! Today I'm going to tell you a little about shade structures and why they are worth the extra expense. Shades are available in several sizes, colors, and designs to fit any area. Shades don't have to be limited to a playground either. 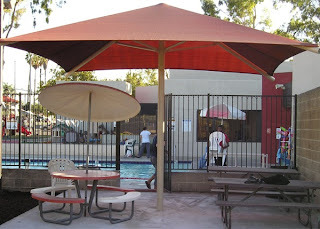 Put them poolside to provide shade to those who want to lay by the pool, but don't want the dangers of UV rays. They also provide great shelter at a park setting. It is important that there is some sort of relief from the sun. Not only because it can get very hot, especially for kids playing, but because it protects them from the UV rays. Any relief from the sun on a hot summer day is welcome! A lot of states require some amount of shade in your playground. If you are worried about the extra cost, some grants are available for UV protection. Personally, I think it is worth the extra amount for a shade. I love being in the sun! But sometimes the sun starts to get too hot and it is nice to have shade to cool down under. It relieves your skin of the sun's strength.